Butlers are there to serve, and you’ll be served up a feast of online bingo when you choose to sign up with this fantastic bingo site. 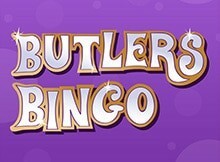 Butlers Bingo offers nearly everything you could ever ask for, including great games and some huge potential prizes. Sure, the bonus isn’t the best around, however you can’t always have everything you want!If you’re looking for a new place to play bingo online, we’d really recommend Butlers Bingo. Take a read through our comprehensive review below and see why you should be playing there. Butlers Bingo haven’t tried to be snazzy with their welcome bonus, instead preferring to offer something simple, yet effective. There are no free spins or other perks, but new players will get a 100% first deposit bonus, which can be worth up to £50 – not a bad bonus at all. The 50x wagering requirement is undeniably quite high, however we’ve seen higher, and even despite this, the bonus is great for those looking to practice their favourite games. Just spend the money quickly, as you only have two days before the bonus expires. Butlers Bingo looks absolutely fantastic. The design of the homepage is incredibly aesthetically pleasing, plus we like the fact that the homepage is short. This short homepage means that you’re encouraged to start exploring the site and finding out exactly what is on offer. Making your way around the site is really easy, and every link you need is found on the top menu. When it comes to the look and feel of this site, we can’t find anything to complain about at all! The majority of the bingo software found at Butlers Bingo comes from Microgaming. This means that you can be completely sure that the games will be both exciting and incredibly easy to play. The fact that the Microgaming bingo network is a busy one is also good news, as it means busy rooms – something that leads to bigger prizes and a more social experience. So, you should really enjoy yourself at this online bingo website. If you’re a mobile bingo player, you won’t be able to download any kind of mobile app for this site. While this might disappoint some, it doesn’t really bother us. This is because we think the mobile website more than makes up for the lack of an app. It looks absolutely fantastic and provides a great playing experience, so what more could you ask for? There are two different types of bingo found at Butlers Bingo – 75-ball and 90-ball. These are the most popular versions of bingo in the UK, so most players will find something that appeals to them. There aren’t any more unusual styles of bingo to try though, meaning that variety isn’t this site’s strong point. You can play the bingo games for a variety of different stakes and the chat is generally lively – perfect for those looking to make new friends while they play. There is one problem with the selection of games though, and it’s the same problem found at most other bingo sites from the Broadway Gaming group, who own and operate the website. This problem is the fact that there are no free games to play – something that will put off many players. Many other sites offer free games with real money prizes, so why can’t Butlers Bingo – along with the rest of the sites in the group – follow this example? Fancy a little break from playing bingo? If so, you should definitely check out the slot machines found at Butlers Bingo. They come from a variety of different software providers, however the best come from Microgaming – the leader in the online slots industry. You’ll find everything from classic slots through to video slots with loads of paylines, so everyone will find a slot machine that suits them. Some of the games we’d recommend include Thunderstruck, Immortal Romance and Break da Bank Again. New games are added regularly, so there’s often something new and exciting for you to enjoy. You will also find a number of progressive jackpot slots at Butlers Bingo, and these are incredibly popular with players. This is because some progressive slots have prizes worth millions. In fact, one lucky Butlers Bingo player managed to win nearly £6 million when they played a progressive jackpot slot. Could you be the next person to win a massive multi-million-pound prize? Most people depositing money at Butlers Bingo will choose to use their credit or debit card. This is simply because most people find it the most convenient way to pay. You can also use Skrill, Neteller, Paysafecard or even cheque at this site though, and all payment methods are completely free. What’s more, all methods will see the money being paid into your casino account instantly, aside from cheque, of course. When withdrawing, you’ll have to withdraw using the same method you deposited with. If this isn’t possible, you’ll need to pick another option, plus you might have to provide some ID before the withdrawal is processed. The processing time for the majority of withdrawals is around 48 hours, which is about average for the industry, and there are no charges attached to most withdrawal options. Butlers Bingo is a tremendous place to play your favourite game, regardless of whether this happens to be bingo or online slots. Bingo players will love the great community of players, as well as the range of games, while slots fans should really enjoy playing for the massive progressive jackpots. All of this can be done in complete safety, thanks to the fact that Butlers Bingo is regulated properly by the UK Gambling Commission. If you’re looking for a brand-new place to play bingo online, Butlers Bingo would be one of our top recommendations. Why not visit today and see why we like it so much? The customer service of Butler’s Bingo is available 24 hours a day, 7 days a week; either via live chat or e-mail. The platform has an extensive and informative FAQ- section.